Dealerships routinely apply a variety of schemes to get you to buy a vehicle from them. Almost all of them are based on an adversarial approach to sales. The salesperson appears to be on your side, sympathizing with your feelings and "teaming up" with you against the sales manager, who lurks behind a glass wall ready to take your money. Over time, the selling systems have developed into more sophisticated methods designed to make sales. We outline the top six dealer selling systems you should be aware of here. The most common system is the Take Over. At some point late in the sales process, you begin to express objections over the price and other terms of the potential agreement. The vehicle has been selected, the test drive went well, your trade-in has likely been appraised and now all that needs to be settled is the paperwork, but you and the salesperson just can't seem to agree. This is where the Take Over, or T.O. as it is commonly called, happens. The salesperson calls in the sales manager or a designated closer to finish off the deal. The premise is that introducing a new face in the proceedings can encourage you to buy despite your reservations about the situation. Often, the sales managers and closer's are even more adept than their sales staff at selling, and apply more pressure and clever tactics. If you are ever faced with this selling system, don't be afraid to put an end to the deliberations and leave the dealership. If you are genuinely uncomfortable with the price, and the terms and conditions are either unsatisfactory or unclear, don't allow yourself to be dragged through this process. You will often find that the dealership suddenly meets your expectations when you reach for the door, as they don't want to lose a sale. If they don't stop you, it is likely that you have just saved yourself from the agony of laboriously negotiating the deal all over again. The next dealer selling system is the notorious Four-Square. 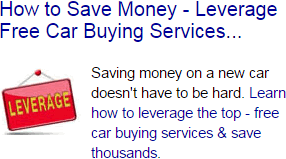 It is one of the most devious and confusing methods dealerships use to manipulate their customers. The salesperson simply draws a cross on a sheet of paper, and asks you for your preferred monthly car payments, how much you want for your trade-in, and how much you want to pay for your new car. Each of these figures is placed in an individual square without argument. It sound easy enough, but you are about to get nailed and should not do business with this dealership. The figures you have outlined will be scratched out and re-written over and over, and with each change you will become more confused. If you stay and try to negotiate back and forth using this system, the dealer will inevitably twist the numbers and can keep you there for hours while they do it. In the end, you will come out the frustrated and exhausted loser in the deal, while the dealership lines their pockets with your money. Many dealerships have adopted a clever ploy that differs from the previous two systems. Instead of pitting you and your salesperson "against" the management, the person behind the famous glass wall sends friendly, hand-written notes out to you via the salesperson. These notes are personalized, with the sales manager referring to you by name. As a rule, you can expect to receive five notes, each asking nicely for more and more money from you no matter how agreeable you are to each condition. This selling system is designed to make you feel like you have bargaining power, and that the sales manager is helping you get the best price. You will also be instructed to avoid sharing the final price, leading you to believe that you just got the inside scoop on the lowest price. In reality, these notes are taken from pre-written scripts designed to get the most profit possible from you, and you have been told not to tell anybody what you paid to keep you excited about your bargaining triumph. Don't be fooled; the only triumph in this deal belongs to the dealership, as they politely empty your wallet right before your eyes. Another dealer selling system that is becoming painfully popular is The Tower. You may come across this in many larger dealerships. It is literally like a watchtower, where sales managers sit and scrutinize every move you and the salespeople make the moment you drive onto the lot. Many dealerships may have a variation of the watchtower, such as a strategically located glass-enclosed manager's office. These watchtowers are positioned centrally and are designed to put pressure on the salespeople, through intimidation, to do everything possible to sell you a vehicle. Not only does this method intimidate the sales staff, but you will feel the weight of the manager's stare, too. You will not be able to make a single move at a dealership like this without a salesperson pursuing you at every step. In the tower, the sales manager may even use binoculars, and has telephones and walkie-talkies to communicate with the ground staff. This is an extremely high-pressure environment, and you can expect the actual negotiations to be even tougher and to involve one or two other selling systems. If you are not up to this game, it would probably be wiser to move on to a dealership with a less adversarial approach to both their staff and customers. These days, more dealerships and manufacturers are advertising a selling system that offers you "One Price", "No Hassle", or "No Dicker". Consumers seem to like this approach because it seemingly eliminates the negotiations, psychological games, and adversarial nature of the car business. With your guard down and your wallet ready to open, you have exposed yourself to getting burned. You might not have to negotiate the price of the new car, but you will be expected to accept less money for your trade-in for that "luxury". You will also get burned in the business office with higher interest rates, unnecessary insurance, and dealer add-ons that you have been pressured to buy. When the dealership is finished with you, it is likely that you will have paid more money for "one price, no hassle" than you would have at another dealer down the street. Finally, you may also encounter a selling system that is called The Spot Delivery. This is the most sophisticated dealer selling system in existence and can spell financial disaster for you. While you are test-driving the new car, the dealership runs an unauthorized credit check on you, and if it turns out that your credit is questionable the scenario described next just might happen to you. You arrive back from the drive, and the salesperson congratulates you because the dealership is going to sell you that very car at the price you wanted to pay. They will tell you that the papers are being drawn up as you speak, and then they actually start transferring the contents of your old car into the new one. You sign the papers, and off you go. However, after a few days the dealership will call and inform you that they couldn't get you financed for the full amount after all. They tell you that in order for you to keep your new car, you will have to pay more money immediately. If you don't have the money and offer to return the new car and take the old one back, the dealership claims that it was sold to another customer and again demands the money immediately. They even threaten to report that the car has been stolen if you don't pay up. You have little legal recourse, because when you signed the paperwork it is not likely that you took the time to read the terms and conditions very carefully. This selling system is designed to put you in a whirlwind state of mind, where everything happens so quickly and everyone is excited at your "good fortune". If it all sounds too good to be true, it probably isn't. This is likely the second largest purchase you will ever make in your lifetime, after a house, so take the time to think everything over and do it right.